So far as they were allowed by the restrictions of the trade gilds, many Jews of medieval times obtained their livelihood by working with their hands. Benjamin of Tudela (1171) refers to many manufacturers of silk in the Byzantine empire, to dyers in Syria, and glassmakers at Tyre. A little later King Roger of Sicily brought Jewish silk-weavers to south Italy to found that industry (Grätz, "Geschichte," vi. 263). Indeed, the trade of dyeing seems to have been almost a monopoly of Jews in southern Europe, and was certainly their favorite form of industry, the tax levied on them being called "Tignta Judæorum" (Güdemann, "Culturgeschichte," ii. 312). The Jewish silk manufacturers of Italy were also distinguished (ibid. 240). The Jews of Lyons, when expelled in 1446, established an important silver-smith business at Trevoux. In Sicily the Jews appeared to have almost a monopoly of handicrafts, and the authorities in 1492 protested against the edict of expulsion, because, as they said, "nearly all the artisans in the realm are Jews." 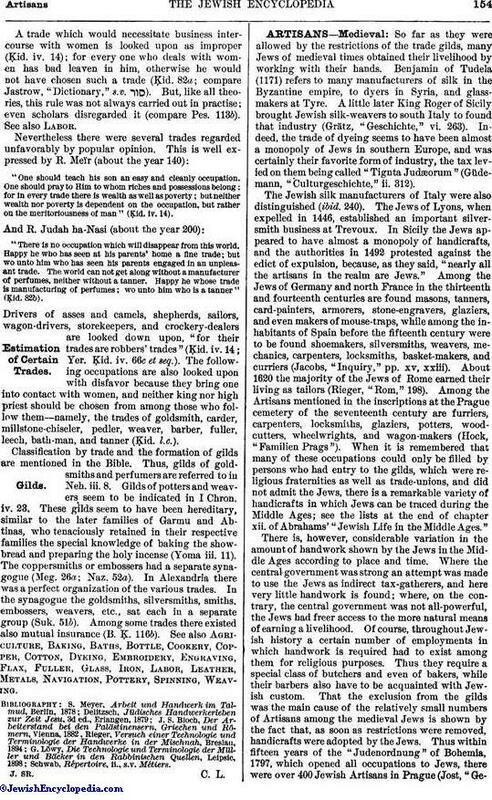 Among the Jews of Germany and north France in the thirteenth and fourteenth centuries are found masons, tanners, card-painters, armorers, stone-engravers, glaziers, and even makers of mouse-traps, while among the inhabitants of Spain before the fifteenth century were to be found shoemakers, silversmiths, weavers, mechanics, carpenters, locksmiths, basket-makers, and curriers (Jacobs, "Inquiry," pp. xv, xxiii). About 1620 the majority of the Jews of Rome earned their living as tailors (Rieger, "Rom," 198). Among the Artisans mentioned in the inscriptions at the Prague cemetery of the seventeenth century are furriers, carpenters, locksmiths, glaziers, potters, woodcutters, wheelwrights, and wagon-makers (Hock, "Familien Prags"). When it is remembered that many of these occupations could only be filled by persons who had entry to the gilds, which were religious fraternities as well as trade-unions, and did not admit the Jews, there is a remarkable variety of handicrafts in which Jews can be traced during the Middle Ages; see the lists at the end of chapter xii. of Abrahams' "Jewish Life in the Middle Ages." There is, however, considerable variation in the amount of handwork shown by the Jews in the Middle Ages according to place and time. Where the central government was strong an attempt was made to use the Jews as indirect tax-gatherers, and here very little handwork is found; where, on the contrary, the central government was not all-powerful, the Jews had freer access to the more natural means of earning a livelihood. Of course, throughout Jewish history a certain number of employments in which handwork is required had to exist among them for religious purposes. Thus they require a special class of butchers and even of bakers, while their barbers also have to be acquainted with Jewish custom. That the exclusion from the gilds was the main cause of the relatively small numbers of Artisans among the medieval Jews is shown by the fact that, as soon as restrictions were removed, handicrafts were adopted by the Jews. Thus within fifteen years of the "Judenordnung" of Bohemia, 1797, which opened all occupations to Jews, there were over 400 Jewish Artisans in Prague (Jost, "Geschichte,"ix. 167). Ten years after the first Jewish training-school for handicrafts was opened in Copenhagen in 1795, there were no less than 740 engaged in handicrafts out of 1,170 adult males (Jost, ibid. xi. 5). See Engraving and Engravers; Gold-and Silversmiths. in Mitteilungen der Gesellschaft für Jüdische Volkskunde, ix., 1902, pp. 12-74. In only a few instances can complete figures be given, owing to the general absence of any information as to religion in occupation statistics; but the interest of such statistics is the greater from their rarity. 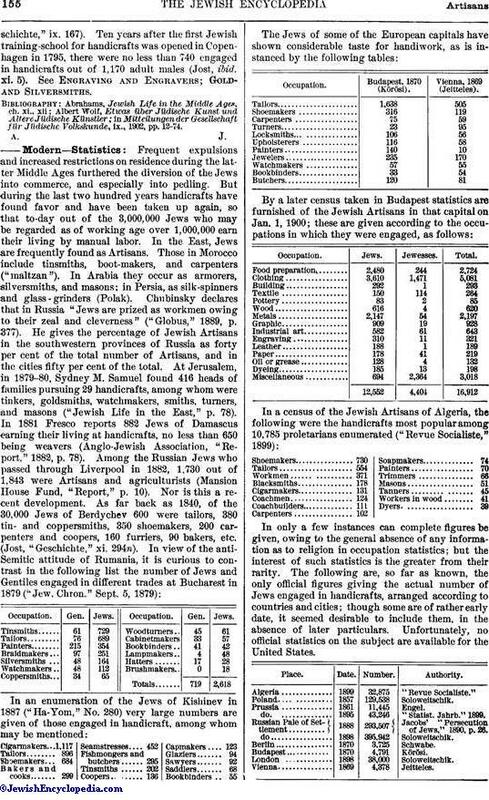 The following are, so far as known, the only official figures giving the actual number of Jews engaged in handicrafts, arranged according to countries and cities; though some are of rather early date, it seemed desirable to include them, in the absence of later particulars. Unfortunately, no official statistics on the subject are available for the United States. Algeria 1899 32,875 "Revue Socialiste." do. 1895 43,246 "Statist. Jahrb." 1899. 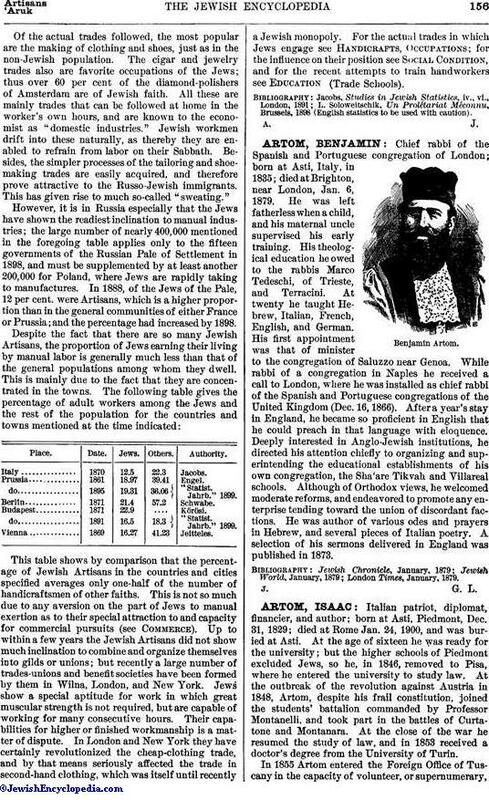 Russian Pale of Settlement 1888 293,507 Jacobs' "Persecution of Jews," 1890, p. 26. Of the actual trades followed, the most popular are the making of clothing and shoes, just as in the non-Jewish population. The cigar and jewelry trades also are favorite occupations of the Jews; thus over 60 per cent of the diamond-polishers of Amsterdam are of Jewish faith. All these are mainly trades that can be followed at home in the worker's own hours, and are known to the economist as "domestic industries." Jewish workmen drift into these naturally, as thereby they are enabled to refrain from labor on their Sabbath. Besides, the simpler processes of the tailoring and shoemaking trades are easily acquired, and therefore prove attractive to the Russo-Jewish immigrants. This has given rise to much so-called "sweating." However, it is in Russia especially that the Jews have shown the readiest inclination to manual industries; the large number of nearly 400,000 mentioned in the foregoing table applies only to the fifteen governments of the Russian Pale of Settlement in 1898, and must be supplemented by at least another 200,000 for Poland, where Jews are rapidly taking to manufactures. In 1888, of the Jews of the Pale, 12 per cent. were Artisans, which is a higher proportion than in the general communities of either France or Prussia; and the percentage had increased by 1898. Italy 1870 12.5 22.3 Jacobs. Prussia 1861 18.97 39.41 Engel. do 1895 19.31 36.06 "Statist. Jahrb." 1899. Berlin 1871 21.4 57.2 Schwabe. Budapest 1871 22.9 .... Körösi. do 1891 16.5 18.3 "Statist. Jahrb." 1899. Vienna 1869 16.27 41.23 Jeitteles. This table shows by comparison that the percentage of Jewish Artisans in the countries and cities specified averages only one-half of the number of handicraftsmen of other faiths. This is not so much due to any aversion on the part of Jews to manual exertion as to their special attraction to and capacity for commercial pursuits (see Commerce). Up to within a few years the Jewish Artisans did not show much inclination to combine and organize themselves into gilds or unions; but recently a large number of trades-unions and benefit societies have been formed by them in Wilna, London, and New York. Jews show a special aptitude for work in which great muscular strength is not required, but are capable of working for many consecutive hours. Their capabilities for higher or finished workmanship is a matter of dispute. In London and New York they have certainly revolutionized the cheap-clothing trade, and by that means seriously affected the trade in second-hand clothing, which was itself until recently a Jewish monopoly. For the actual trades in which Jews engage see Handicrafts, Occupations; for the influence on their position see Social Condition, and for the recent attempts to train handworkers see Education (Trade Schools). L. Soloweitschik, Un Prolétariat Méconnu, Brussels, 1898 (English statistics to be used with caution).